Wine Club shipments are in February, May, and October. If a shipment doesn't show up by the end of the month, you might have an expired credit card on file with us. Give us a call to update your info. (800) 446-7505. We usually need the entire month to get all of the shipments completed. Feel free to check in with us anytime if you have questions. Welcome to Fermentations - We have moved to main street! After 17 years in the old location, we have moved to a larger, corner location at 2306 Main Street in the East Village of Cambria! Come by and check out our new space. Travel, adventure, intimate dinner parties and gatherings - these are all common bonds of those of us who enjoy the Fermentations lifestyle. At Fermentations we are constantly discovering wonderful new gourmet foods, wines, unique gifts for friends and business clients, and accessories for entertaining in the wine country lifestyle. Sharing the experience with you is one of life's great pleasures. We invite you to enjoy shopping on the web site, via our catalogue and toll-free number, or at our store which is open 10 am - 8 pm daily at 2306 Main Street in the East Village of Cambria, California. 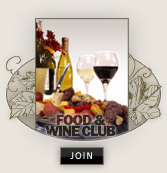 Join us for gourmet food and wine tasting, and an unforgettable wine country shopping experience. We have had so many requests, perhaps some time soon we will open a Fermentations in your region to bring us even closer to you! Visit FERMENTATIONS at this web site, or in person. FERMENTATIONS, is located in Cambria's East Village, halfway between San Francisco and Los Angeles, just below Big Sur, 10 minutes south of the Hearst Castle, and within 30 minutes of the Paso Robles wine region, which wine and travel writers agree is "like Napa... the way it used to be" -- outstanding wines, beautiful terrain, and a friendly, welcoming atmosphere.